The Canon EF 14mm f2.8 L II USM Lens is exacting professional's ultra-wide angle lens and uses UD and aspherical elements for paramount image quality and sharpness across frame. Thanks to its maximum f/2.8 aperture lens ensures great low light performance. lens features an integral lens hood and is designed to prevent unwanted stray light from entering lens. 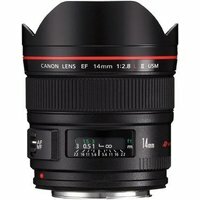 EF14mm lens is a specialised, professional L-series lens and offers an impressive 114° angle of view when being used on a full frame camera (EG. 5D Mk II, EOS 6D). lens features a USM (ultra-sonic motor) motor for fast and near silent autofocus and full-time manual focus override is possible via large rubber ring.